Her eyes shine with a glistening borne of moonbeams. His strong and handsome jaw sensually masticates his burger as he turns eating fast food into an art form. She looks extremely fetching in that red sheath. He comes home after a two-hour workout smelling like a warm Snickerdoodle, fresh from the oven. These aren’t just two people in love! They are love. What could ever go wrong for two people so profoundly perfect for each other? Probably nothing…as long as they have had “the talk.” If not, Gildshire gives them a 50/50 chance at most. That’s how crucial it is that couples have an in-depth talk about money before making a full and lifetime commitment. Money matters and financial strategy is a highly important thing to discuss. Why do we believe it is so important to interrupt the hearts and flowers long enough to talk about financial matters? Studies for the last 50 years up to now indicate that the family’s finances are Number One as the cause of marital conflict. Financial strife comes in even ahead of how old should Daddy’s little girl be to acquire that death’s head tattoo that she wants for her birthday. Those studies also show that conflicts over money are the top reason that couples split the community property and go separate ways. “If it’s that important, tell me what I need to know to get started on the discussion.” These are Gildshire’s best tips for conducting “the talk.” First of all, if this is the first serious money discussion the two of you have had, conduct this get-together in a private place where you are both comfortable. Things can get testy, even between couples who are the most compatible and reasonably minded. Second, be sure to cover these essential points. Credit Strategy: We know some people who employ credit cards virtually exclusively, and then pay just one bill at the month’s end. Other folks have been dragged into this century kicking and screaming, only recently learning how to use an ATM. For these people, it’s “Buy groceries with a debit card? Please, child. I’ll write a check, thank you.” That’s okay. This is about information gathering and compromise. The important thing is to find the solution where both parties feel empowered and respected. Besides, that’s just one piece of this credit puzzle. The second piece requires total honesty about your personal credit history. The Good Book says all have sinned and, chances are, at least one of you has sinned with great gusto! Bring those sins to the discussion and talk together about what can be done toward making the financial outlook better. Student Debt: Student loans are a scourge on society and a potential financial hurdle for a couple planning a future together. If their plan is jointly filed taxes, those repayments can go up if they are tied to income. because once you’re married both incomes count. As for ultimate responsibility, federal student loans are the responsibility of the student only. But, if you refinance the loan, both spouses are on the hook. The Who said it best. Who are you? Every couple includes a saver and a spender. It’s been that way since the dawn of time. The crucial point about who is who is to remember one thing. There are no bonus points for being either, and neither can expect to win every time. Let’s be truthful here. Savers can come off pretty smug. Spenders are often less than as prudent as they should be. Following a monthly budget, but including escape hatches for busting the budget (a little) is one key to a happy relationship. The escape hatch can be as uncomplicated as choosing an amount that either party can spend without the necessity of calling home first. 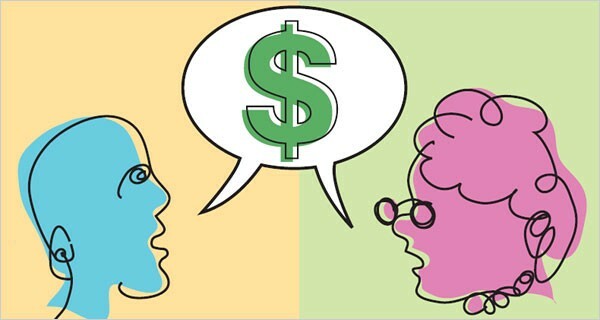 Higher amounts require closer communication, and a big spend requires a face-to-face. We think those are rules both can live by. Was that terrible? We didn’t think so. Look how pretty she is in that red sheath. Catch a deep breath worth of his manly Snickerdoodle scent. You’ll enjoy being together even more after the money talk. Good luck, crazy kids! Gildshire is rooting for you.